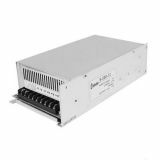 LED power supply Dimmable Driver, triac, input voltage 220-240VAC, output voltage 20-40VDC, BY05-60120 LED power supply Dimmable Driver from Braytron with maximum output power 18 W, output voltage 40-60VDC and output current 30 mA. 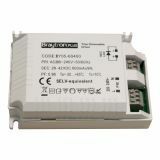 LED power supply Dimmable Driver, input voltage 220-240VAC, output voltage 25-42VDC, BY05-60400 Dimmable LED driver from Braytron PLUS with max. out power 37.8W, output voltage 25-42VDC, input voltage 220-240VAC and input power max.42.8W. Lifetime 20 000h. Warranty period is 3 years. LED power supply VSP12-12, 12VDC, 1A, 12W, waterproof Hermetically sealed in a waterproof aluminum housing switching power supply. The device has a variety of applications for external promotional and informatonal signs and elements. Solves the problem with external lighting. Applicable in wet areas. List Price 13.50лв. VAT Incl. 12.80лв. VAT Incl. 12.15лв. VAT Incl. LED Power Supply 12VDC, 3A, 36W, IP67, waterproof, WP12V36W Compact power supply unit for general purpose applications with input voltage 220- 240 VAC, output voltage 12 VDC, output current 3A and output power 36W. Suitable for moisture and dust areas IP67. Warranty period 1 year. LED power supply 12VDC, 4A, 48W, IP65, waterproof, WP12V48W Hermetically sealed in a waterproof aluminum housing switching power supply. The device has a variety of applications for external promotional and informatonal signs and elements. Solves the problem with external lighting. Suitable for moisture area IP65. Manufacturer warranty 1 year. LED switching power supply LPC-60-1400, 42VDC, 1400mA, 58.8W, IP67, waterproof LED driver adapter, waterproof, with constant output current 1400 mA, output voltage 9 - 42 VDC, wide input voltage range 90 - 264 VAC. Overload, overvoltage and short circuit protection. Highly efficient and compact. List Price 39.90лв. VAT Incl. 37.80лв. VAT Incl. LED power supply 180VDC, 280mA, 50W Pulse, LED power supply with maximum power 50 W, output voltage 180 VDC and output current 280 mA with input voltage 220 - 240 VAC. LED Power Supply 24VDC, 4.2A, 220VAC, 100W, IP20, non-waterproof, BYO2-11000 Compact power supply unit for general purpose applications with input voltage 230 VAC, outpuт voltage 24 VDC, output current 4.2 A and output power 100 W. The product has an EMI filter, surge and overload protection. 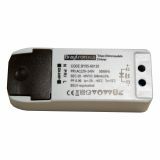 Power LED Driver 98-126VDC, 260mA, IP20 LED driver with maximum power 40W, input voltage 180-260VAC, output voltage 98-126VDC, output current 260mA. LED power supply (current driver), 80-95V, 420mA, 40W LED power supply with maximum power 40 W, output voltage 80 up to 95 V and output current 420 mAdc, input voltage 220-240 VAC. 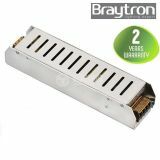 LED Power Supply 12VDC, 220VAC, 8.5A, 100W, IP20, non-waterproof, BY02-01000 Compact LED power supply unit from Braytron for general purpose applications with input voltage 230VAC, outpuт voltage 12VDC, output current 8.5A and output power 100W. Suitable for dry conditions IP20. Warranty period 2 years.